Ehrlich said we would need drastic population measures—like adding drugs that would sterilize people to their drinking water—to have any hope of avoiding catastrophe. Saving humanity would require preemptive genocide. The 1972 book Limits to Growth—a more sober analysis than The Population Bomb or Famine 1975!—projected that if then-current trends didn’t change we’d overshoot the planet’s capacity to support us by the middle of this century. (6) Some scientists have made the case that we’ve already exceeded the “planetary boundaries” that represent the limits of the Earth’s natural systems to endure disruption. (7) The non-profit Global Footprint Network estimates that under current conditions it would take one and a half Earths to produce what we consume and absorb our waste on a sustained basis. We’re certainly overshooting the planet’s limits in the sense that we produce more carbon dioxide than the planet’s ecosystems can absorb. And there’s little question that we have already altered the planet in ways that will have severe and to an extent irreversible consequences. In general, dire predictions of world food shortages and environmental disasters have underestimated our ability to find ways of increasing agricultural productivity and avoiding ecological problems. Forecasters have predicted catastrophe more or less continually since the days of Thomas Malthus. In 1898, the physicist William Crookes warned that, unless a way were found to synthesize nitrogen fertilizer, developed countries would run out of food in thirty years. By 1913, a pair of German chemists found a way to synthesize nitrogen fertilizer on a large scale. The development of the Haber-Bosch process averted a possible food crisis, just as the Green Revolution would roughly 50 years later. Simon challenged those who disagreed with him to name five commodities that would increase in price over the next decade. Paul Ehrlich rose to Simon’s challenge. Ehrlich’s group bet that overconsumption would drive up the prices of chromium, copper, nickel, tin, and tungsten over the next ten years. Ehrlich’s group lost their bet. By the end of the decade every one of the commodities they had named was actually cheaper in real terms. Meanwhile, population growth—contrary to Malthus’ expectations—has begun to slow on its own. As countries have industrialized, birth rates have fallen dramatically around the world. According to World Bank estimates, the global fertility rate—roughly, the average number of children women have during their childbearing years—fell from 4.9 in 1960 to just 2.4 in 2011. Given current childhood mortality rates, each woman would have to have on average more than 2.3 children just for the population to remain stable. The United Nations reported in 2012 that the fertility rate has fallen below replacement levels in 75 countries. In Singapore, the fertility rate is just 1.2, which means that every ten potential parents have a total of just six children during their lifetimes. Globally, we may have already reached what Hans Rosling calls “peak child”—the largest generation of children may already have been born. And the fertility rate is still falling. The world population will continue to grow for some time. That’s because of what’s known as “demographic momentum”: since it takes years for newborn children to reach childbearing age themselves, populations will continue to grow for a while after fertility rates drop below replacement levels. In addition, although fertility rates are declining almost everywhere, they are falling slowly—and in a few cases rising slightly—in parts of tropical Africa. And while the number of new children born may have peaked, people around the world are living longer and longer lives. Right now, the world population is increasing by 80 million—the equivalent of 4 new Beijings—every year. The latest UN report projects the population to grow by to 9.6 billion by 2050. Of course, those additional people won’t simply be consumers of resources. Humans are, as William McGurn puts it, “minds as well as mouths”. (13) We don’t passively live off the land, but actually improve it in many ways. Even though many of us may consume more than we contribute, a few people with innovative ideas can make an enormous difference. The more people there are in the world, the more people there are to cure diseases, develop new agricultural techniques, and so on. New technologies have the potential to benefit everyone, not just now, but in the future as well. And ideas, unlike natural resources, aren’t consumed when we use them. In his excellent book The Infinite Resource, Ramez Naam asked whether we would better off if only half as many people had ever lived. (14) The world, of course, would be unspoiled in many ways. But it’s not clear we would be better off, since we’d also be without the contributions of all the people who had never lived. Consider that two thousand years ago—when roughly around half as many people as have lived today had lived—there was little plumbing and no electricity. Child mortality was high, and life expectancies were half what they are now. There was no democracy in the modern sense and most of humanity lived a meager, second-class existence. It might be that we would be better off in some sense today—now that many of us live already in free, technologically-advanced societies—if there were half as many people. But we owe the innovations that made our modern way of life possible to the people who lived over the last 2,000 years. So too the people who are alive now will help solve the problems we face now. Feeding another 2.4 billion people—a third as many as are already alive today—will be a challenge in many ways. 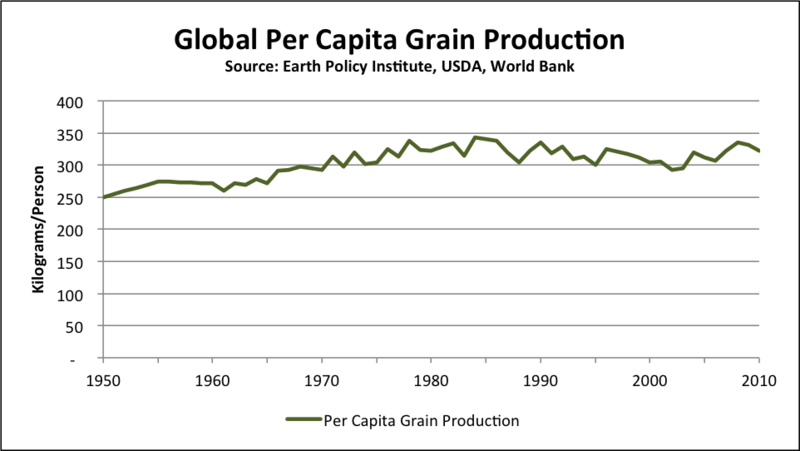 But thanks to increases in agricultural productivity we already produce about enough food today to feed the projected population of 2050 about as well as we fed the population of 1960. Unless there’s some catastrophe, the planet should be able to support the additional people with the technology we already have. The greatest stress on global resources is not how many of us there are, but how much we consume. Broadly speaking, our ecological impact has grown with the global economy. As we’ve become richer, we’ve eaten more food, used more energy, produced more waste, and generally put more pressure on the natural systems that we depend on for our survival. While the planet should be able to support even a growing population, it’s not clear the planet can support a growing population as well as we might like. We are getting rich fast. The global average income increased roughly 125% over the last 20 years. Over that same period the global population grew just 30%. Most of that growth is occurring in parts of the world where the average person consumes relatively little. While the global population is beginning to peak, there is still plenty of room for the world to develop economically. But if everyone in the world earned as much as the average American does, the global economy would be around five times as large as it is today. It should go without saying that we’d be pushing the limits of the planet’s natural systems to support us if our impact approached five times what it is now. But the connection between economic growth and environmental impact is not as simple as it might seem. While there is a clear relationship between national wealth and carbon emissions, for example, there’s also a fair amount of variation among different countries. 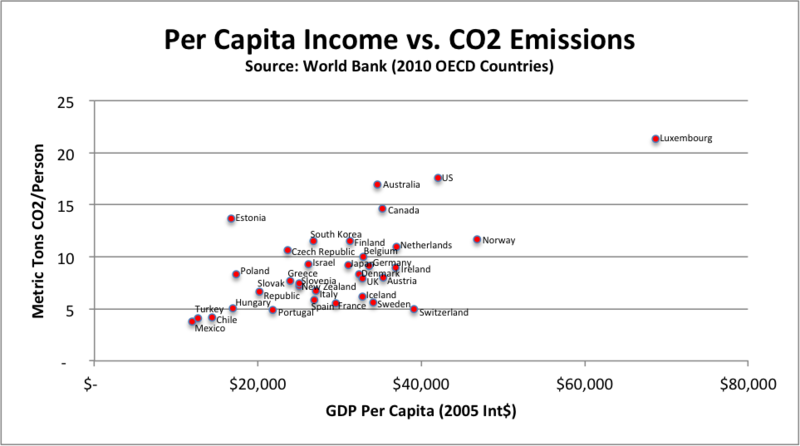 Norway and Switzerland have roughly the same standard of living as the US while producing much less carbon dioxide per person. Some of the difference is the result of technical and institutional choices those countries have made. That means that even with currently-available technology high emitters like the US should be able to dramatically lower their carbon emissions without substantially reducing their standards of living. 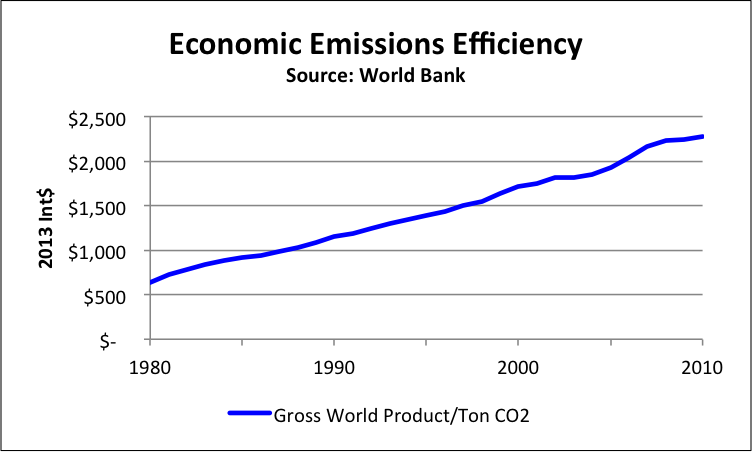 Nor is there a fixed relationship between the size of the economy and carbon emissions. Emissions aren’t growing as fast as the world economy. Every year we create more economic value for every ton of carbon we emit into the atmosphere. As countries become richer and move farther out of poverty, it makes sense for them to spend more to reduce the damage they do to the environment. Richer countries have made an effort—if not as much of an effort as we might like—to reduce their carbon emissions. Poorer countries, where population spends a larger share of its income just to get by, are less likely to invest in clean energy. But they nevertheless benefit from clean energy technologies developed in the richer countries. Globally, we produce around three and half times as much today per ton of carbon emitted than we did in 1980. There’s reason to think that carbon emissions—along with other ways we impact the environment—may eventually “decouple” from economic growth, so the world economy can grow without more doing more damage to the planet’s natural systems. Even though a growing economy puts more stress on the planet in the short term, faster growth may actually help us create sustainable societies more quickly. The richer we are, the more resources we have to mitigate or repair the damage we’ve already done. In addition, as people around the world move out of poverty, they are able to contribute more to our store of knowledge. Right now the talent of many potential scientists’ and inventors’ goes to waste in poor countries because they don’t have the opportunity to develop or to use it. Alex Tabarrok pointed out several years ago that if the whole world were as wealthy as the US, there would be more than five times as many scientists and engineers as there are. (16) A wealthier, more educated world would also means a larger market for new technologies. Tabarrok noted that if both China and India were as rich as the US, the market for cancer treatments—along with the incentive to develop them—would be 8 times larger. The larger the world economy grows, the more resources and the greater incentives we find solutions to a whole host of problems. Fortunately, growth is not in itself the problem. What will determine our fate, to a large extent, is not whether the world economy grows, but how it grows. Growth may slow on its own—particularly to the extent that it depends on a supply of cheap energy in the form of oil—as the costs of using the planet’s resources increase. But either way we should take measures to make sure that growth improves rather than diminishes our ability to thrive. Rather than trying to limit growth directly, we need to make sure—through things like cap-and-trade schemes—that market prices and legal incentives reflect the real environmental costs of our economic activities. Because those with entrenched interests in the old system of incentives will fight any changes, it won’t be easy. We have work to do if we want to continue to live comfortably on Earth. The challenges we face today may prove to be more difficult to overcome than the challenges we’ve faced before. While it would be silly to assume that there are no technical solutions to the problems we face, it would be foolish to count on technologies that haven’t been invented yet to solve our problems. And, as Vaclav Smil has pointed out, it’s likely to take decades to switch over to cleaner, more efficient sources of energy. (18) The longer it takes, the greater the chance of disaster. No one really knows at what point the damage we are doing to the planet will be catastrophic or irreversible. “Our progress in the use of science has been great,” President Kennedy wrote, “but our progress in ordering our relations small.” (19) We’re still not close to any hard limits to growth. The technological challenges we face should be manageable. The real question is not whether we are theoretically capable of surviving. It’s whether in fact we’ll manage to do what we have to before it’s too late. The battle to save humanity certainly isn’t over. But we do have to fight if we want to win. 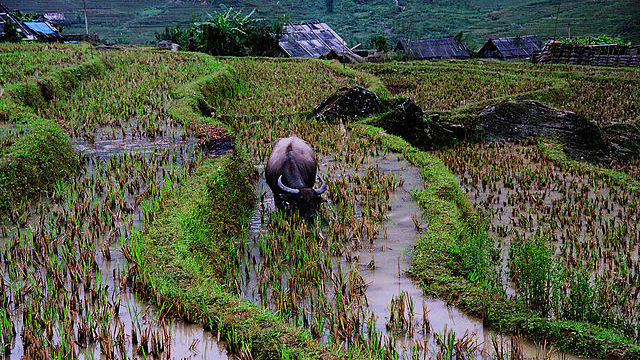 Terraced fields of Sa Pa, Vietnam image courtesy of Robert Tannemaat under a Creative Commons Attribution Generic license. The image has been cropped. This entry was posted in Economics, Existential Risk and tagged carbon dioxide, climate change, economic growth, existential risk, famine, fertility rates, green revolution, haber-bosch, jfk, julian simon, limits to growth, longreads, paul ehrlich, paul paddock, planetary boundaries, planetary resources, population growth, ramez naam, ronald reagan, thomas malthus, william crookes, william paddock. Bookmark the permalink. 6 Responses to Have We Reached the Limits to Growth? I agree that, contrary to popular opinion, we haven’t reached the limits to growth yet. But I don’t share your optimism regarding the demographic transition in developed countries. According to this report, it is coming to an end, and we are facing another baby-boom. The latest UN projection calls for 11 billion people by the end of the century. I do think that is possible that 11 billion is still much lower than Earth’s carrying capacity for humans. But I don’t believe that it is possible for us to keep the population significantly below the carrying capacity in the long run. As a matter of fact, in ecology there is no theory that allows for any species to set the size of its population. Even humans are not above the laws of nature, and I consider population growth to be one of them, specifically a law of ecology. (To learn more about the laws of ecology, I recommend reading Laws, Theories, and Patterns in Ecology by Walter Dodds.) Since it’s inevitable that we will get to Earth’s carrying capacity for humans, the question is What is life going to be like then? This is an issue I will explore on my Darwinian Demon blog. Thanks for the thoughtful response, Meurtter. I agree that there are ecological pressures that push us toward carrying capacity. To the extent that fertility rates are genetically determined, they are likely to increase over the long run as people who are predisposed to have more children do have more children. But the laws of ecology are not like the laws of physics. We can, unlike most other animals, to some extent short-circuit our natural impulses with contraception and family planning. The report you link to makes some excellent points, but it strikes me as fairly speculative. It could certainly be that we are on the verge of a large new baby boom. I think the error bars on any long-term forecast are always pretty wide. But the report seems to project relatively short-term trends to continue indefinitely. I think that’s unlikely for the same reason I think it’s wrong to imagine that just because fertility rates are declining now that the human population will eventually start to dwindle away. My guess would be that fertility rates will not rise back above replacement levels in the developed world any time soon. In the longer run, with different economic and environmental conditions, potentially longer lifespans, and the possibility of reengineering human biology it seems to me that population levels are anyone’s guess. I find the author’s assertion that the world could produce enough food for 280 billion people absurd. Sadly, this is the typical musing of academics who would rather write papers than worry about real work. Those messy “details” get in the way and just complicate the perfect mathematical models. Unfortunately people hear this sort of “fact” and it takes on a life of its own. This happens all the time. I am reminded of the often cited “data” used when people talk about nuclear weapons and the ability to kill everyone on the planet 4 times over. You hear things like “we have the equivalent of more than 4,000 lbs of TNT for every man woman and child on the planet”. Well the truth is that many people – in fact the majority of the planet – would survive a full-scale nuclear war because all those weapons are not equally distributed. It is the same with this food argument. The fact is people move to where the jobs are and that is frequently nowhere near the food sources. In fact all over the world there is a massive migration into cities and out of the countryside. Sure in friction-less, vacuum world with spherical chickens everyone gets their 1.2 acres of land to feed themselves. In the real world we can’t even feed the current population successfully. With massive amounts of genetic modifications and the use of technologies such as irradiation, polymer barrier coatings, and bio-engineered “insecticides” I suspect the world can support maybe 2 to 3 its current population (with a similar percentage of “collateral starvation” due to war, civil unrest and climate variations. I guess time will tell. I understand what you’re saying, Mark. 280 billion is an absurd number. I don’t think that in practice we can or would want to come close to having that many people on the planet. The point I was trying to make—and the point of the original paper, I think—is that our population isn’t really limited by the amount of energy available. The real limits on our population growth are technological, social, and political. As an aside, I think a full-scale nuclear war would pose a major threat to the human race, because of the effect smoke and particulate matter kicked into the atmosphere would have on the global climate.